"Easily organize and manage poker tournaments"
Poker, and specially Texas Hold'em Poker, has become incredibly popular in the past years. If you and your friends want to organize a poker tournament then you might want to take a look at the application presented here, called Poker Tournament Supervisor. Poker Tournament Supervisor is a full-featured poker tournament management solution for not only amateur but also professional poker tournaments. It comes with a powerful poker timer that will display very useful information for the players, such as current and elapsed time, players left, average chips, small blind, big blind and ante, and more. Additionally, it can record and display statistics which are furthermore exportable. 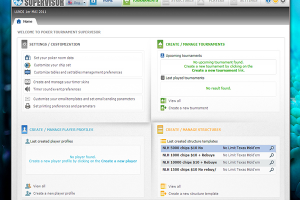 But perhaps Poker Tournament Supervisor's most attractive feature is that its interface is customisable. There are not only several skins included but you can also create your own using the skin designer, and what is more, it also lets you virtually recreate your chips and display them on the screen.